Costs – See what tree owners in Santa Rosa, California have paid for tree services like maintenance and removal in the past. FAQs – There are different type of trees that will thrive in Santa Rosa, but it’s important to know about the tree regulations and diseases that prevent some from growing particularly well. Learn more. Services – Get a pro out to your house today! How Much Do Tree Services Cost in Santa Rosa? Located just outside of San Francisco in California, Santa Rosa is a coastal city along the Pacific Ocean. The region’s Mediterranean climate with fog and moderate temperatures is ideal for many types of flora, but managing and maintaining trees can be a hassle for some property owners. This guide can better explain the key jobs delegated to professionals in the tree service industry. Trees can make a property look attractive, but there are some instances where it is better to have the tree removed altogether. A dead tree, a drying tree, one that is a safety risk or a tree that is infected with disease or pests should be removed by a professional. By tethering the tree, professionals can bring down the trunk safely without damaging any nearby structures or the surrounding landscape. The average cost of tree removal in Santa Rosa is $610 to $840. While having a stump on a piece of property might not seem like a significant problem, it can be a hazard and even attract insects. The quickest and simplest way to get rid of a tree stump for good is to hire a professional company to grind it away using a large commercial grinder. The average cost of stump removal in Santa Rosa is $85 to $145. Plenty of humidity means that tree growth is rapid in Santa Rosa. Trimming and pruning are annual tasks for property owners, but they can be relegated to professionals if budget permits. The average cost of tree maintenance services is $520 to $740. Pruning is best done in the spring, but tree trimming can be done throughout most of the year in this part of California. Although Santa Rosa is a densely populated city, it boasts some undeveloped urban forests as well as an impressive tree canopy in the downtown area. Those new to the area, or even those just new to tree care, can appreciate the tips and suggestions included in this tree guide to Santa Rosa, California. Some people are under the impression that four distinct seasons are required to have successful fruit-bearing trees, but that certainly isn’t the case here. Santa Rosa’s mild temperatures are fantastic for any number of fruit trees. Just a few of the varieties that thrive best in the environment include braeburn, Fuji and gala apples, Bartlett and Seckel pears, mariposa and satsuma plums and Japanese persimmons. Since 1937, the official state tree of California has been the Sequoiadendron giganteum. This towering tree is better known as the giant sequoia or giant redwood. It is found primarily in the northern part of the state, specifically in Humboldt Redwoods State Park. For those who want to spot one of the tallest trees in the region, it is worth taking a short drive outside of Santa Rosa to the Armstrong Redwoods State Natural Reserve, which is home to dozens of incredibly old and tall trees. The tallest of all is the Parson Jones tree, which stands at an astounding 310 feet tall. 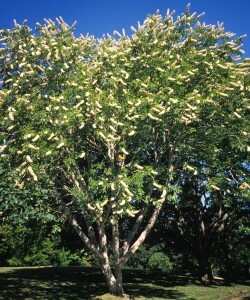 Growing much shorter trees within the city is popular; many residents choose dwarf fruit trees that take up little space at just 6 to 8 feet in height. In 1990, the City of Santa Rosa created a tree removal law in order to prevent too many trees from being removed during the city’s rapid development during that time. Today, there are still a number of regulations in place for those living in residential parts of the city. Heritage trees can not be removed without a permit, and even non-heritage trees with a diameter of more than 4 feet require a permit before removal will be allowed. However, certain trees are exempt from these regulations and can be removed at any time without a permit, including poplars, silver maples, acacias, Monterey pines and hawthorns. Most of Santa Rosa’s electricity needs are met by the Pacific Gas and Electric Company, which maintains thousands of miles of roads, tree branches and overhead power lines. Although residents are allowed to plant any tree they choose on their property, it may need to be removed or trimmed if it endangers the power lines. For that reason, it is recommended that individuals only plant trees or shrubs that mature at 20 feet or less within 50 feet of overhead power lines. Despite the optimal growing conditions for trees in Santa Rosa, pests, insects and a variety of diseases can become a serious problem over time. Some of the most common worries for trees owners include phytophthora root rot, cytospora canker, sooty mold and fire blight. 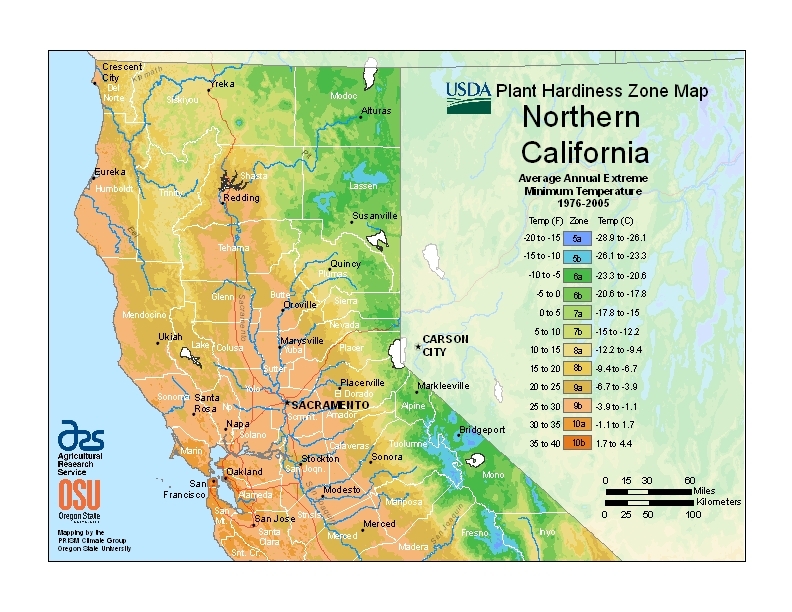 According to the USDA, Santa Rosa is classified as having a hardiness zone ranking of 8a. This influences tree choice because all trees have a climate in which they grow best, and that number is usually found easily online or at a tree nursery. In Santa Rosa, trees that will thrive are those between 6b and 8b as outliers may not be able to handle either the winter temperatures or the warm and humid summers.